Clean and cut the leeks: leeks are very easy to clean when cut in half down the length of the leek so you can wash out any dirt particles that worked their way inside the leek. Then cut in slices (like half moons), using also the dark green parts. In a pan melt the butter on low heat and add the leek, salt, nutmeg, and pepper. Simmer for about 10-15min – at slow heat so as not to overheat the butter! Meanwhile prepare the filling: whisk the two eggs with the white wine, some salt and add the cream. 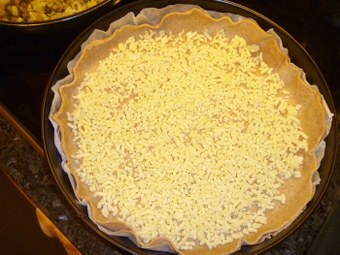 Prepare the tray: put the dough onto the tray and stab it with a fork (prevents the dough from forming a huge bubble in the oven) and cover it with grated cheese. Cover the dough with the precooked leeks and pour the filling over it. Bake in oven on a bottom rack for about 30min. Remove from oven and slide Waie onto from the baking tray onto a grate to cool it (this prevents soggy Waie), or serve immediately. 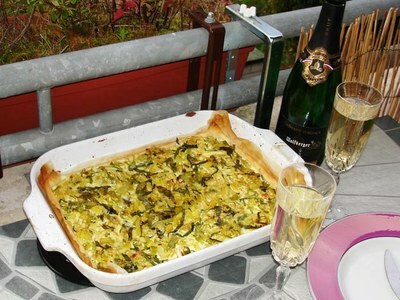 Serve with salad and a glass of white or sparkling wine – here in the area (Northern Switzerland/France) we can serve a Cremant d'Alsace with it, in California (or anywhere else for that matter) a nice Californian sparkling wine on a hot summer night…. Enjoy! Tip: use a whole-wheat spelt dough, that makes it more rustic and goes well with leeks. Tip: keep some good quality, grated cheese in the deep freezer so you always have it ready. In Switzerland I buy in winter the grated fondue cheese mixture (Vacherin and Gruère), keep it in the freezer, ready to take a handful to use for these kind of dishes and gratins.